Ecuadorian and Colombian scientists carried out a scientific expedition to estimate the population size of these cetaceans in Ecuador’s northern Amazon as part of the South American River Dolphin Initiative. Reventador volcano and its mushrooming cloud of ash in the horizon are signs that the Ecuadorian Eastern Range has been left behind and that ahead of the group is the Amazonian plain. The WWF-Ecuador and Omacha Foundation team is headed to the Cuyabeno Fauna Production Reserve with a clear objective: to seek river dolphins and estimate their population size. This expedition forms part of SARDI, the South American River Dolphin Initiative, a group of organizations from the region that seek to promote research and the conservation of these mammals and their ecosystems from a regional and transnational approach. Last year, thanks to research efforts based on satellite tagging of dolphins in Bolivia, Colombia, and Brazil, pink dolphins were included in IUCN’s red list, which classifies them as being “in risk of extinction.” Previously, there was not enough data to designate a category to this species based on their state of conservation. This designation evidences the need to work for the conservation of Amazonian river dolphins, but it is only the beginning of a long process. On March 19, 2019, a team of Ecuadorian and Colombian scientists began an expedition to the Aguarico River and its tributaries, in Ecuador’s northern Amazon. The expedition started in the touristic area of Laguna Grande in Cuyabeno, where approximately 16,800 tourists arrive each year, some of them drawn by the mythical river dolphins. The expedition lasted three days, and the team worked for 12 hours each day traveling by boat on the four rivers of Cuyabeno’s lacustrine system: Aguarico, Lagartococha, Cuyabeno, and Cocaya. They covered 10 to 12 km of the system per hour. Progress is slow since they must collect and record data correctly in the fieldwork forms. The main objective is to identify the greatest number of dolphins possible, and to achieve this they must pay attention to the subtle movements of these mammals. Using a methodology approved by SARDI’s scientific community, the data obtained will allow scientists to sample individuals in this area and determine the size of their populations, identify their habitats and important sites for conservation, and determine the threats they face. The expedition was a great success. After arduous work, the team saw 48 individuals of the two river dolphin species that exist in Ecuador. The great majority, 45 in total, are the well-known pink dolphins (Inia geoffrensis) and the other three individuals are grey dolphins (Sotalia fluviatilis), a species that is much less common in the region of Cuyabeno. Siting these particular individuals is thrilling for the scientists involved. The most recent study, carried out in 2012, to determine the biological and cultural diversity of the tri-national corridor of protected areas (Paya, Cuyabeno, and Güeppi Sekime) determined that in the area of Ecuador, 21 to 32 individuals of the previously mentioned species could be seen. Even though the expedition was successful in relation to the number of individuals observed, reality in Ecuador, and the region as a whole, is different. These mammals are threatened across the Amazon for a series of reasons. The most important one is the degradation of their habitat, rivers. Pollution from mining, agricultural practices, and the undue management of wastewater in upstream towns have degraded the quality of water and affected dolphins and their prey. Additionally, works of infrastructure like hydroelectric dams interrupt the flow of rivers and do not allow dolphins, and hundreds of other species, to move freely along Amazonian rivers. Finally, in certain places of the Amazon, dolphins are hunted and their flesh is used as bait to catch commercial species. Ecuador’s northern Amazon is a strategic place to carry out research on and for the conservation of this species. That is why WWF, with support from SARDI, will continue doing research on these mammals in Ecuador and the region. 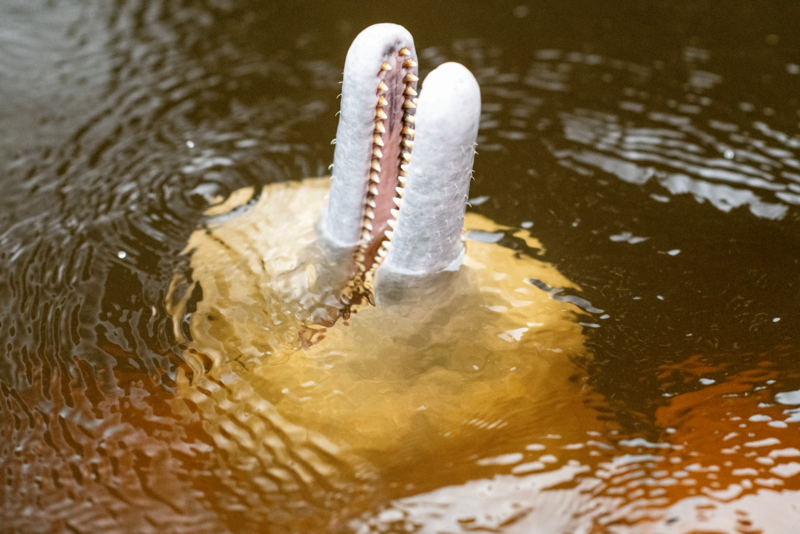 River dolphin conservation is key to the general health of the Amazon biome. The Amazon is a region known for its storage of water, since 20% of the world’s freshwater is held in the Amazon biome. Its climate regulation and carbon storage roles depend partly on the large amount of water available. Amazonian aquatic ecosystems are live ecosystems and the main habitat of approximately 800 fish species. Dolphins are key to maintaining the wellbeing of aquatic Amazonian ecosystems, since they are umbrella species. Being at the top of the trophic chain, their state of conservation reflects the general wellbeing of rivers. Taking care of dolphins is synonymous to taking care of Amazonian rivers, and only by ensuring their conservation across the region and using a transnational approach can we be able to guarantee the wellbeing of the Amazon biome. Thus, this expedition joins more that five previous ones carried out in Bolivia, Peru, Brazil, and Colombia as part of the South American River Dolphin Initiative.